I know this website is mainly about basketball cards, but I also sell and collect a few baseball and football cards here at the site. It is always fun to post here in the blog about a few cards I pick up from time to time. With the 2017 baseball season only a few weeks away, I figured I would pick up a few baseball cards off of eBay. They are pictured above and below this post. 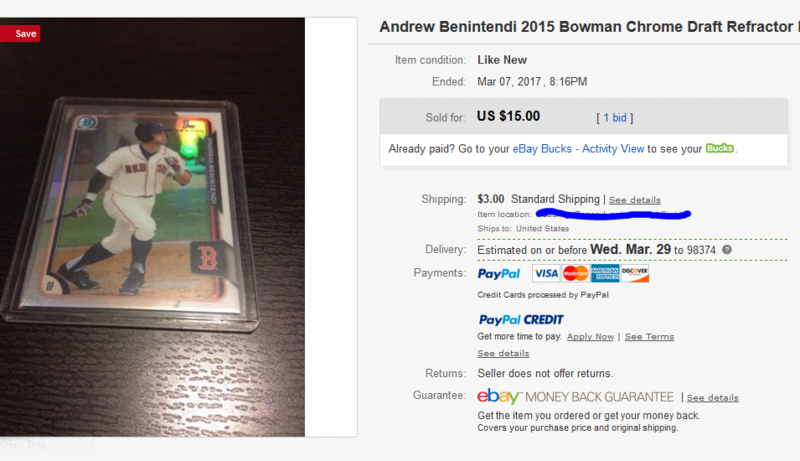 They are 2 different auctions that feature 3 Andrew Benintendi 2015 Bowman Chrome Draft Refractor rookie cards. It is card #182. The first auction had 2 of these Benintendi Chrome Refractors and the second auction had one. I paid $25 for the two cards and $15 for the one. I may have overpaid a bit, but Andrew Benintendi is the #1 MLB prospect going into the 2017 baseball season. It will be very interesting to look back at this post in a few years to see if this was a wise decision on my part. 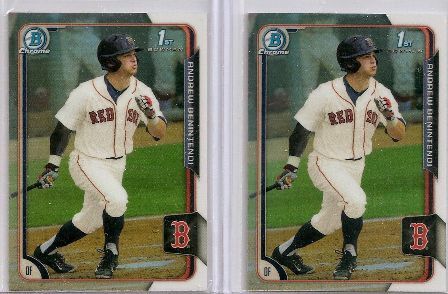 If Benintendi has a solid year in his first full MLB season and his Boston Red Sox make a deep playoff run, these cards could possibly move up in price, which I am obviously hoping for. He did show some promise when he was called up to the big leagues in late 2016. He made his Major League debut in Seattle against the Mariners at Safeco Field on August 2, 2016. He played in 34 games for the Red Sox and batted a solid .295 with 11 doubles. On the other hand, Benintendi could completely flop in 2017 as the Big-League pitchers learn his weaknesses and expose him at the plate. If that happens, then my decision on getting these 3 cards could blow up in my face. Please…god..NO! LOL! Prospecting is both a fun AND dangerous game sometimes. Only time will tell.